Assorted Notions: Join the Seattle BurdaStyle Sewing Club! 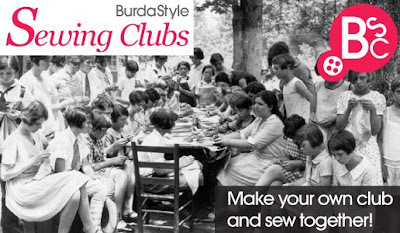 Join the Seattle BurdaStyle Sewing Club! Attention Seattle-area stitchers! Put down your pincushions and listen up. Are you interested in meeting other people who like to sew, and who appreciate the BurdaStyle vibe? Here's your opportunity. I have volunteered to organize a BurdaStyle Club in Seattle and I would love for you to get involved! Where: I know of two fabric stores, Stitches (Capitol Hill) and Pacific Fabrics (multiple locations) that can provide free meeting space for us. Other locations (coffee shop?) could work too. When: I'm thinking a weekend day or possibly a weekday evening. I'd like to get input from everyone, and eventually work out a regular monthly meeting, like "the 3rd Sunday of the month at 10am" so there's some predictability. - show and tell - the fun part of sewing! All skill levels are invited. And you're welcome to join whether or not you've made a BurdaStyle pattern. I love the site and check it religiously on Mondays for the new release, but for some reason I've only made 2, well, 1.5, of their patterns (the very basic Lydia tee, and the Alison swimsuit which is a UFO hidden in a dresser drawer right now). I think this is cause for me to get going on a new garment from the site. If you're interested, send me an email (my address is on the right) and let's get this started! Edited to add: I'm aiming to have the first meeting in early June. So you're interested in being part of a BurdaStyle club but you're not in Seattle? Check out other US locations here; international locations will be announced soon. I LOVE the idea of doing photography sessions. It would be so lovely to get another sewist to photo my stuff on location, instead of using the self timer in my bedroom. If I was in Seattle I'd join you. Funny, I was actually going to e-mail you about this today! I'd LOVE to be part of your group, and I applaud you for organizing one! I haven't been sewing much lately, as I'm pregnant and due ANY DAY, but this would be a wonderful way for me to get back into the real world of sewing again (post baby). Keep me posted as the plans develop! Darn! Really wish I was still in Seattle (for this and other reasons). But thanks for the link to other groups. I may have to check out a group here in Chicago. The 'all skill levels' bit sold me. I'm interested. My availability is somewhat unpredictable, but would you email me when you set up the first meeting? I'll keep checking back here, too. I'd be very interested and may have a friend or two who'd join in as well. Weekend days are best for me. Dang it, I'd certainly join if I wasn't on the "dry side" of the state! I also wanted to mention that I ran across your website about 6 months ago and it really got me motivated to not only do more sewing but get back into a more couture type sewing. I am really looking forward to meeting you in Portland too. How awesome! I'm currently in between houses (apt on capitol hill and house in NE Tacoma) so I would prefer it's a weekend day (I love morning, doesn't cut into the day) than a weekday evening, I also carpool during the week, back down to the southend, so that would make the time for me to get back up to Seattle quite a bit longer.. I'm available all day on weekends, do keep me posted!